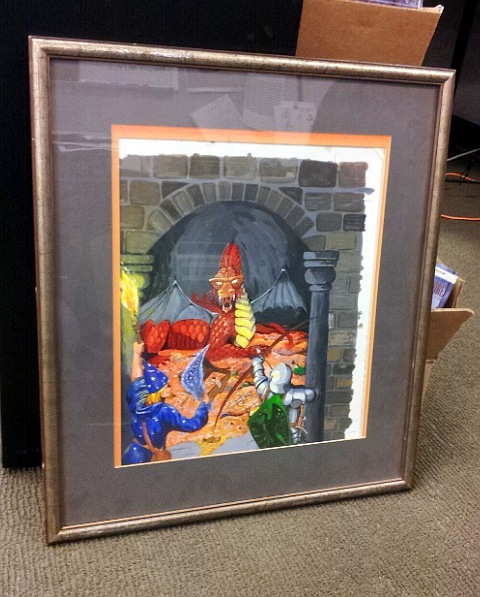 Jon Schindehette, the D&D Art Director at Wizards of the Coast, had this painting in his office on Friday. It had been found in a WotC warehouse during a clean-out of old boxes. This was in a box with other paintings, most of them only around 10 years old. Fortunately, the warehouse folk know that before disposing of art, they need to alert someone up the chain and wait for instructions. 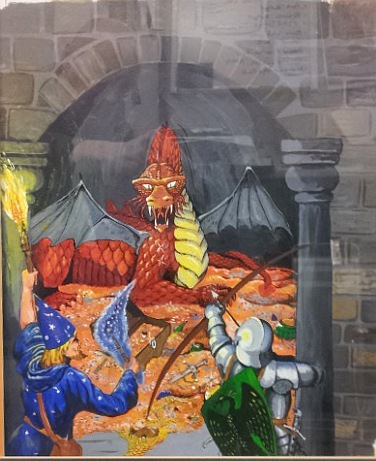 In case you don't recognize it, this painting was created by Dave Sutherland and used as the cover of the D&D introductory set in 1977. It's one of the most iconic images in the history of D&D. It looks like the board has shifted down and to the left in the frame, but I didn't see any damage to the painting itself. The colors are amazingly vibrant. I honestly don't recall where this painting hung at TSR. It may have been in Gary's office or some other executive area where I wouldn't have seen it every day. As we all stood around admiring it, Jeremy Crawford observed how it really captures the spirit of D&D. That's true of most of Dave's illustrations. He was foremost a player and a DM, and he captured the experience of a D&D adventure unfolding in your mind better than any other illustrator. So much of this type of art has been lost over the years, that the fact this painting still exists makes me inexpressibly happy. Having it resurface in a packing crate is, for roleplayers like me, equivalent to a lost Picasso or Rembrandt turning up in someone's attic. It's no surprise that since I sent out the first news about this yesterday on Twitter, it's been retweeted 65 times and still counting. These photos, taken in Jon's office with my phone, don't begin to do justice to the original. The amount and sharpness of detail in the painting is amazing. You can count the brush strokes. Dave loved detail, whether he was painting like this, drawing in black and white, painting miniatures, building a model, or rendering a map. 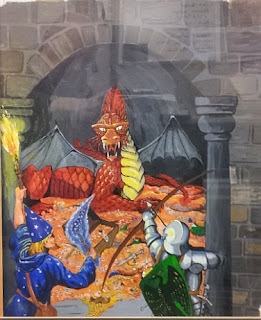 We'd all like to see the painting cleaned up and reframed with protective glass, then hung where WotC employees and visitors can enjoy it again. Posters are a remote possibility, I suppose. I even suggested a limited, collector's edition of the 5E Basic Rules with this on the cover, but that's a real longshot. At the very least, I'd love to get some quality photos of it posted on the website or in Dragon online for everyone to enjoy. And coincidentally today is the birthday of the late Dr. Holmes, editor of the 1977 Basic Set! Stuff goes in the trash everyday. That this D&D artifact is preserved is, well, it's a natural 20. Double damage! Thanks for sharing this Steve. This wasn't the cover "my" edition of D&D, but I sure as heck recognize that artwork. What a wonderful find! I would give it to Mr. Sutherland's family. That was the cover of my first exposure to the game, a box stolen from my brother when I was in 6th grade. Just seeing it fills me with something I can't really describe, some kind of wistful nostalgia. Like smelling an old girlfriend's perfume in a crowded elevator. This is my first time to see it in color. Wow. Wow! I still have that image on what used to be my first boxed set. The box fell apart but I couldn't bear to throw away the lid. Thanks! Any update on what is to be done with it?